Wednesdays were Toby the dog's day. He volunteered at a mental health facility in the patient recreation program. In addition to getting patients outside for walks and a fun game of fetch, Toby's presence on the unit encouraged socialization between the patients, and a lighter energy overall. How Toby became a therapy dog is an interesting story. Interestingly enough, Toby's job as a therapy dog was the result of Maggie the behaviorist who in her assessment of Toby's incorrigible behavior, she noted his intuitive and gentle nature with people, and his desire to attend to people. 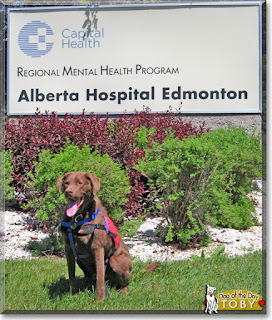 We pursued training and testing for Toby, and he became an award winning therapy dog. Toby's job as a therapy dog became therapy for him in a sense. Shortly after Toby began volunteering on Wednesdays, his behaviour improved. There were fewer episodes of destructive behaviour at home, less separation anxiety and Toby's confidence improved. Animal Assisted Therapy (AAT) is not only a program at hospitals, but there are schools, group homes, senior's facilities, libraries, and treatment programs where animals are part of a human's treatment or educational program. The transformation in Toby after he started his volunteer work so so profound that I wrote a short story for Chicken Soup for the Soul- what I learned from the dog. 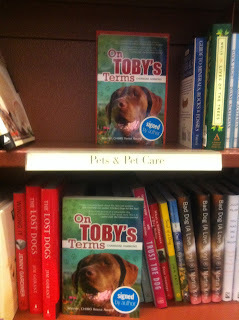 The following year I wrote On Toby's Terms. 4) Enjoy the opportunity to volunteer with your pet and make such a PAWsitive difference in the lives of others. The holiday season is upon us and many people will exchange presents and celebrate festivities. At the Puppies Behind Bars organization, puppies are giving the gift of joy, service and compassion all through the year. Carl Rotans joined me on PAWsitive Radio. Carl is the senior instructor for Puppies Behind Bars (PBB), a non-profit organization that trains prison inmates to raise, train and care for puppies that will become service dogs for the disabled and explosive detection canines for law enforcement. 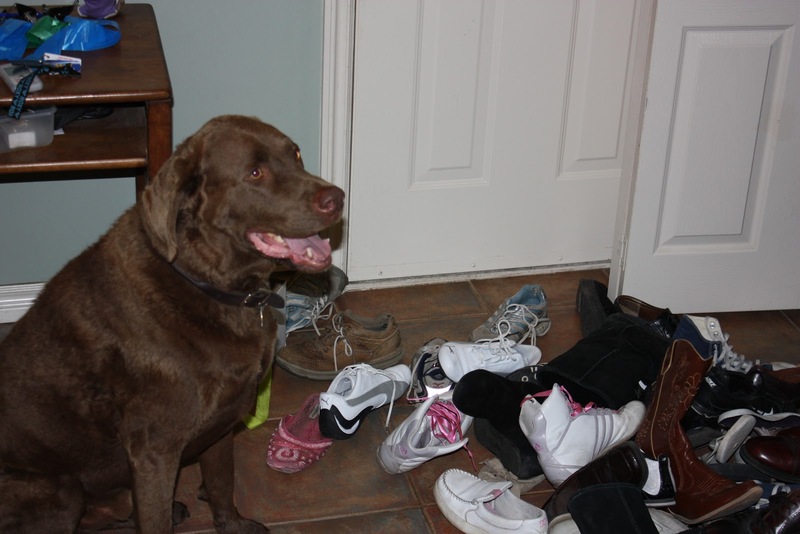 Mr. Rotans took his love and passion for his own Labrador Retrievers, and began his career in dog obedience training. This lead to his employment at a nationally renowned guide dog school located in the New York metropolitan area. It was here that he worked and received formal training and eventually took an instructor position with PBB. Now as the Senior Instructor his duties include the training and instruction of new staff as well as opening and preliminary instruction for the program in new correctional facilities. Founded in 1997 by Gloria Gilbert Stoga, PBB has become a world leader in prison dog raising programs and operates in correctional facilities in three states. The quality of the dogs produced is second to none, but equally important is the effect the program has on the inmates who care for the dogs. The puppies live in prison with their ‘puppy raisers’ from age eight weeks until eighteen months. As the puppies mature into well-loved, well-behaved dogs their raisers learn what it means to contribute to society rather than take from it. Carl stated that the puppies enter the jail when they are eight months old, and are trained by inmates who have been carefully assessed and trained themselves to take the puppies through a two year program, training them to be service dogs. These puppies are nurtured, trained, and loved by inmates who undergo specialized training. The program is a beautiful example of the many ways that dogs can impact and change lives. The inmates who are part of this program spend 24 hours a day with the puppies in training, and contribute to society and to a veteran who will need a service dog to improve their quality of life. You can listen to some beautiful stories of the different puppies behind bars and how this program is changing lives on the inside and outside of the bars. Is your pet a PAWty Animal? 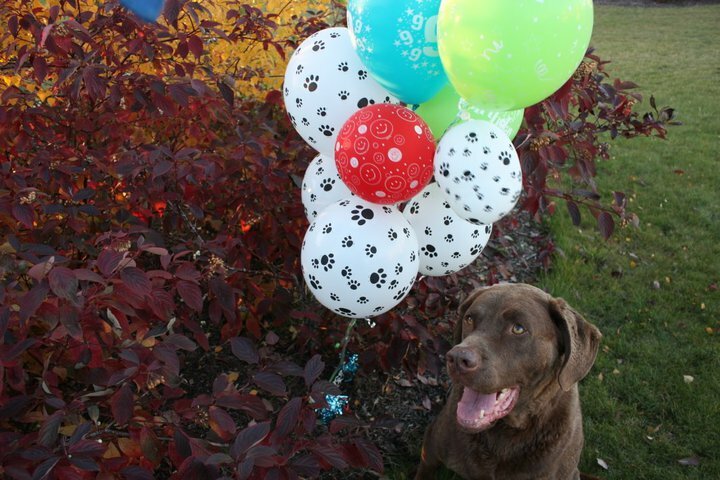 Our dog Toby always loved a good celebration, here he was on his 9th birthday party. 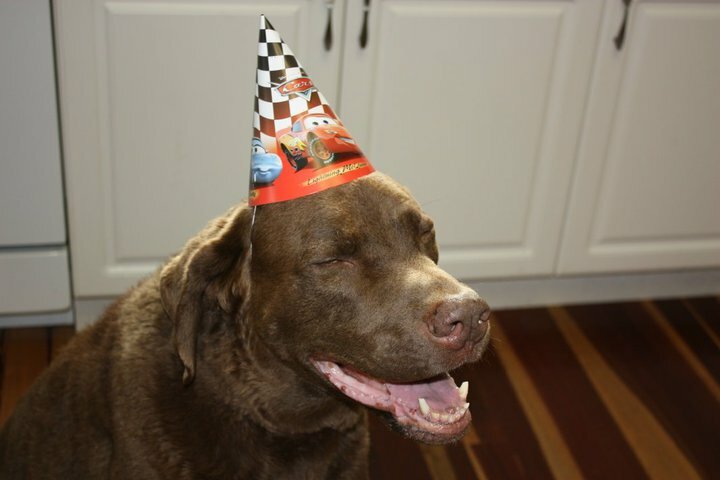 What events do you celebrate with your pet? 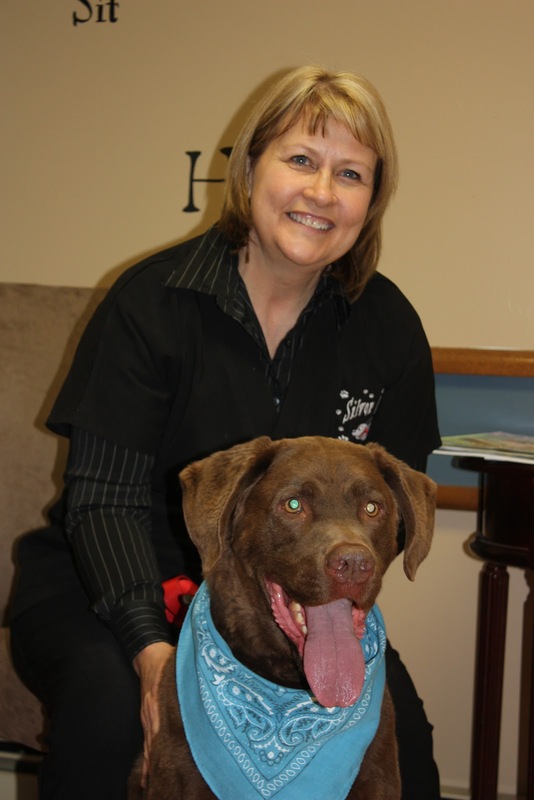 I interviewed Paula, the owner of High Hopes for Pets on my PAWsitive Radio show. Paula Etchison is the Founder, CEO & Pack Leader of The High Hopes for Pets Company, LLC.Creating a brand that would help erase the issue of animal homelessness is an idea originated by Paula. A life-long animal lover, and parent to both dogs and cats, Paula’s passionate about pets and the idea of businesses giving back to the communities they serve. Paula believes businesses should be fun, learning-oriented places to work where people help one another to do well and do the right thing.She carried around the idea of Birthday and Celebration cupcakes for dogs in her head for nearly 10 years, and after twenty years of working for other companies, she thought it was time to start her own. Friends, who know her well, will attest that she sets high standards for herself and the people around her, and it’s her hope that you can see the same caring and passion in High Hopes’ delicious real dog treats. And, they donate a portion of the sales to a foundation that provides funding to a number of animal shelters and rescue organizations. You can host a pet party, and order healthy and delicious treats for your pet thorugh High Hopes for Pets. And, you can bake the treats as a family activity. Toby is our forever (or as we say.... furever) pet, a family member who created a legacy that will be long remembered. Yes, Toby had a shoe fetish... or a desire to re-arrange the way we put shoes away... it seemed shoes were a lot more fun in one big pile outside the closet. This photo shows Toby after one of his closet masterpieces. He looks quite impressed with his work. 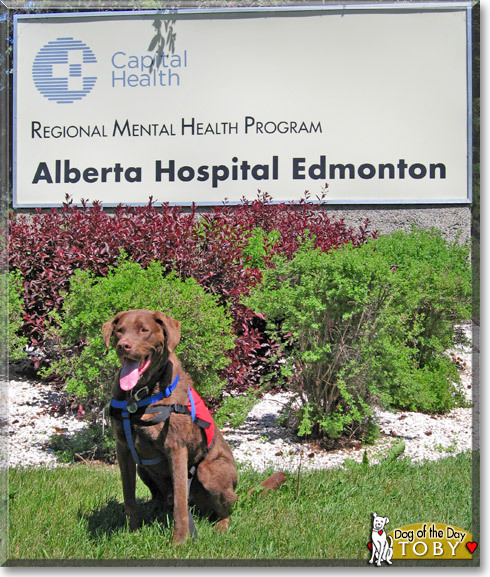 As an Animal Assisted Therapy Dog, Toby impacted many lives at the hospital he volunteered, and at the many schools he toured when his book On Toby's Terms came out. Toby taught us about patience, he knew that good things came to those who waited. If he stared at something long enough.... it would become his. This photo of Toby with his new toy makes me smile, he stared at it for the longest time before picking it up and discovering it squeaked. This is the perfect photo of patience and focus. Play and friendship was a the highlight of Toby's day. Whether his friends were furry, feathered, four legged or two, he was ready for a good game of fetch. Dog Beach in Del Mar California was Toby's favorite place. When we pulled in, Toby would bark from the car until he reached the water, his tail wagging so hard we thought he would take flight, it was like a propeller. 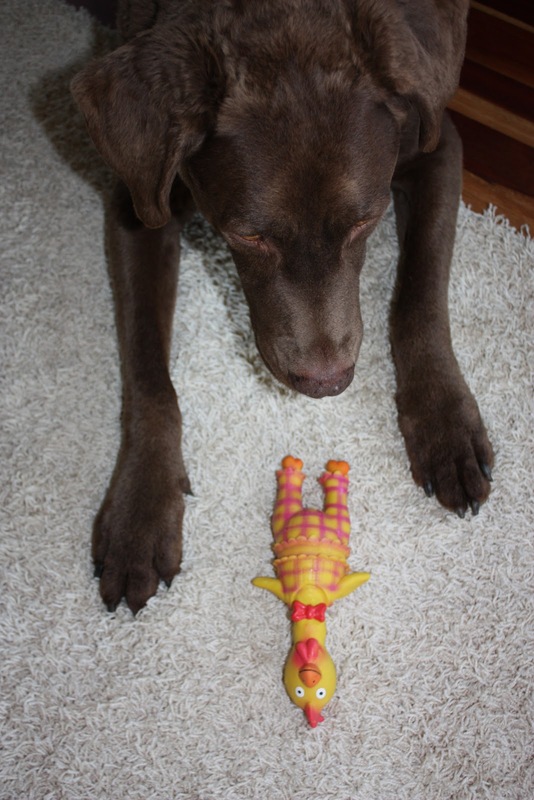 It was not uncommon for Toby to find the other dogs who loved to play fetch, and take a turn with their toy. The good news was that he always returned the toy when he was done with it. And after a good day of play, spreading love wherever he went... there was nothing like curling up with the sunlight pouring through the window and having a good nap. What are the moments you cherish with your pet? What lessons did your furry family member teach you? Today, give your animal family member, a little more attention and love.... acknowledge how they make our world a much better place. Doggie Daycares were one of our Toby's favorite places to be. Dogs...Toys...People.... Stimulation.... Treats all in one place. We found that Dog Daycares were a great way to social Toby, provide him with additional exercise, and be with other dogs. We were honored when Sandi asked Toby to be her guest of honor at their grand opening. He had such a great time, we had to bribe him to the car at the end of the day. Silver Paws Dog Day Care also carries Toby's books in their store. 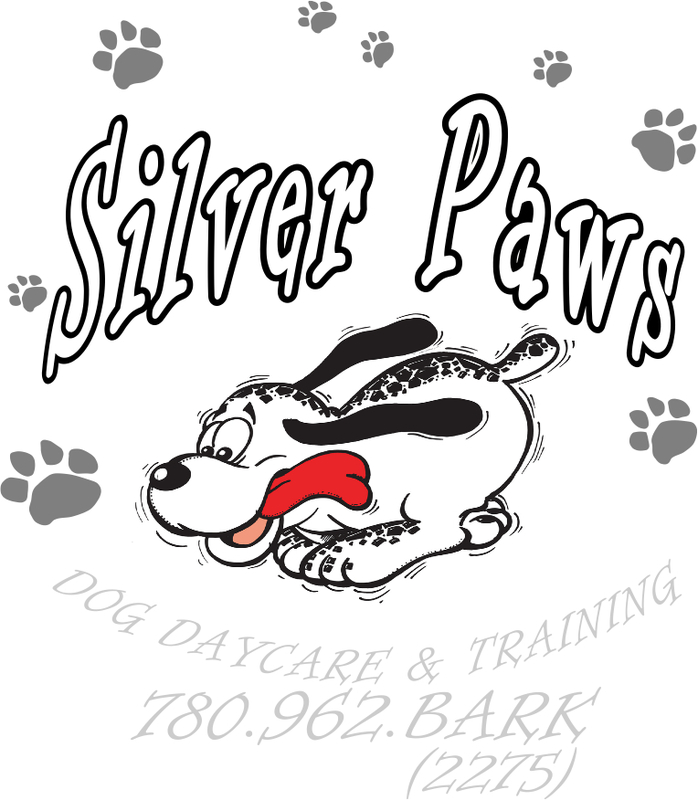 "Bring your dog to Silver Paws Dog Daycare & Training while you are away at work and bring home a satisfied, relaxed, content dog at the end of the day.Socialization is a key component to having a balanced dog. Dogs are social beings, they need to be with other dogs. 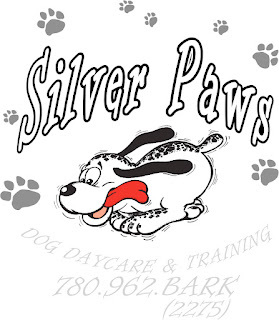 At Silver Paws your dog will have lots of activities, interactions with other dogs and our qualified staff, and be under constant supervision." Silver Pawa has over 3000 square foot play area has solid rubber floor to avoid joint strain. They clean and sanitize every day to ensure the health of your dog while he is here. 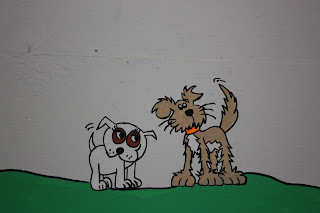 There is also a fenced secure area outdoors for the dogs to potty, so as not to undo any training they have. Their staff LOVES dogs! And they always say "your beloved pet will get lots of hugs and kisses and attention all day. Your dog deserves the BEST! Thank you Silver Paws for being a champion for Toby and his legacy!! During the interview I shared how Toby helped me overcome my fear of sailing, as he overcame his fear of diving into the water. Toby taught me many things, including patience, persistence, playfulness and the power and ripple effect of unconditional love. 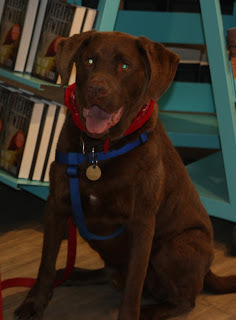 We also talked about the role that becoming an Animal Assisted Therapy Dog (AAT) played in changing Toby's behavior from incorrigible to incredible. Who do you know that could benefit from the unconditional love of an animal? How has an animal impacted your life? What is the best thing you ever learned from your pet? We would love to hear your story! Did you know that donating one blanket to a shelter can save two lives? It is likely that the one dog will be adopted and when that happens, another dog can await finding their forever family. Snugly blankets make dogs more adoptable! Eileen Smulson was our guest on PAWsitive Radio All Things Pets, and I thoroughly enjoyed interviewing her. She is the founder and President of Operation Blankets of Live, an award winning nonprofit public charity. They collect and distribute recycled and new pet related items to comfort stray, sick neglected and abused homeless animals in shelters, rescue groups, sanctuaries and foster groups. They are also an Emergency Response Team that partners with those organizations who provide relief and comfort to animals that are displaced or endangered by catastrophe. Her adopted dog Ginger was the inspiration for her to start this charity. She wanted to make sure that every homeless pet had warmth and comfort by having a blanket to snuggle in while waiting to be adopted by a loving family and forever home. So one blanket really does save two lives. The research is showing that shelters who have snugly blankets for animals instead of cement floors are more adoptable. And the impacts on the animal of course are extremely positive. Operation Blankets of Love hosts blanket drives and also does presentations in schools and to children and youth programs. They also engage schools in blanket drives, which is a very positive learning experience for children to be engaged in animal kindness and making a difference. · How could you host a blanket and towel drive? 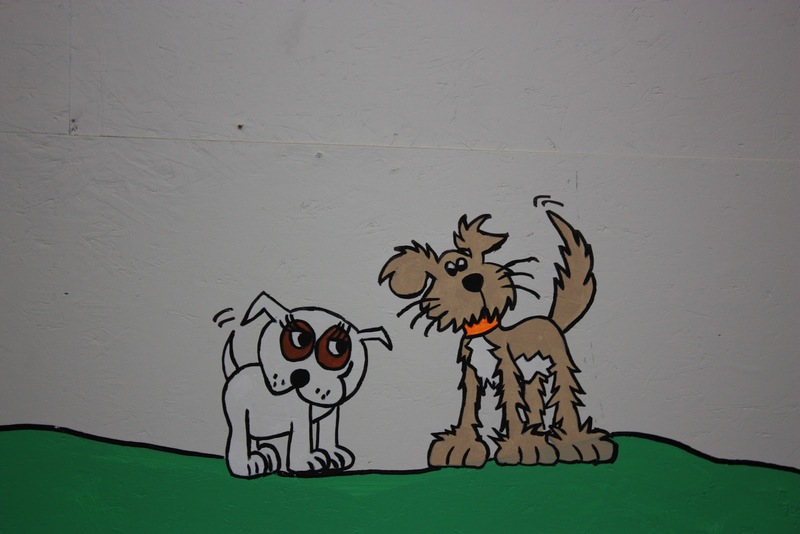 · How could you support your local animal shelter? It starts with sharing the message. Then by taking action. thank you Eileen for all you do to positively impact shelters, and the many animals awaiting a forever family!